Miss Dixie O'Dare: Announcing A Sew-Along!!!! Vintage inspired sewing and living. And cats. I know we are getting into a pretty busy time of year, but it was one of my blog goals for 2015 to host my own sew-along, so I figure now is better than closer to Christmas! Also Frocktober seemed a suitable time to sew a new Frock. 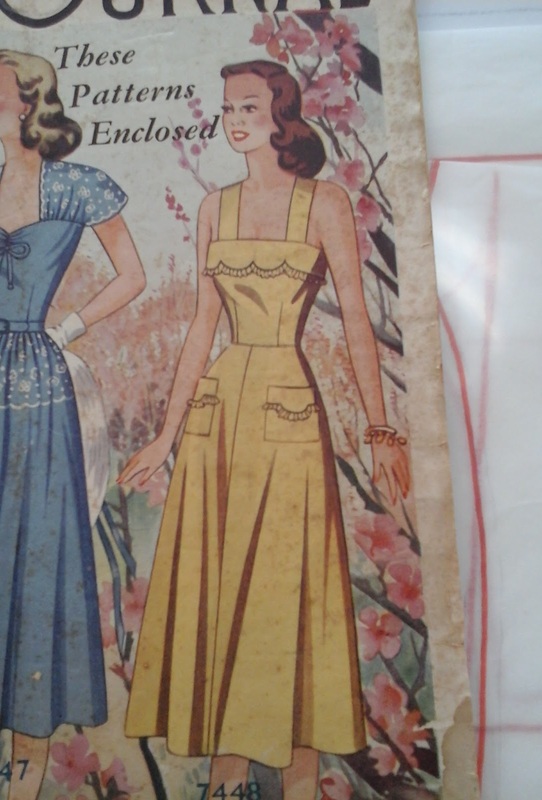 On offer to all my lovely readers for the Sew-along is an exclusive, specially graded version of this beautiful Sun Frock from the October 1949 of the Australian Women's Home Journal. The original pattern is for a 36" bust which is roughly an Australian size 10 and I have graded up to a 44" for myself which is about an 18. From there it was pretty simple to grade to all the sizes in between, as well as one size down (34") and one more size up (46"). I have not yet digitised any patterns, so this one will also be hand drawn. While I am happy to give you the pattern for FREE for the duration of the Sew-Along, the catch is that it will not be posted on the blog to download, but rather I would like everyone interested in joining the sew-along, or just wanting the pattern to email me at dixieodare@gmail.com and I will personally email each of you with the pattern. I do ask that you do not email the pattern to others, or sell the digital pattern for your own profit. 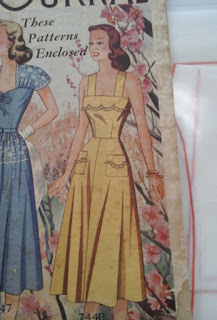 Should you wish to sell dresses made from the pattern I don't mind, but would love to know. The Deadline to be included in the round up post is November 30th, so plenty of time to get it done. I will try my hardest to keep to this schedule, but please forgive me if I fall a little behind, life is like that sometimes. Of course, you can join in the Sew-Along at any point by emailing me, but the earlier you do, the more time you have to choose your fabric and notions! Those are both very pretty! Pretty! Will we have a choice of doing either the yellow or the blue, or are you just doing one of them? Just the Yellow one in the middle of the frame. I'm not quite dedicated enough to be grading 2 patterns and scanning them all in bit by bit for a free PDF. I would like to join you, even though I'm bait late, and despite the fact that a sundress in the cold Swiss late autumn seems to be a bit ridiculous... But then, you never have enough dresses, and with a jumper it would be also wearable in the cold season. I sent you a request and hope to catch up and finish my dress in time - thanks for all your work! Drat, I'm too late for this one! I would like to join your next Sew Along. You pick really pretty patterns! A woman possibly born in the wrong time.... I love all things 1950's and try to wear 50's fashion as much as possible. I love baking and sewing, so that's probably what you'll see me write about most. I am hoping to sew plenty more clothes for myself, so I will eventually have a predominantly me-made wardrobe. Finished Kitty Valentine Dress Plus the FREE PDF Pattern! Like my Blog? Then check these out!